The superstar cellist, who turns 60 this year, remains on a constant quest to, as he puts it, “better interpret the world” through performances and creative collaborations. He’ll appear in Seattle on May 3. 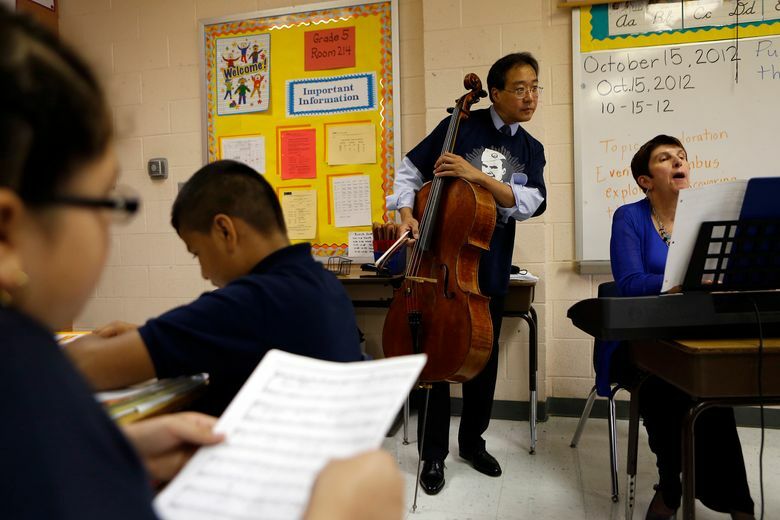 Yo-Yo Ma has long been one of the most recognizable classical musicians on the planet and one of today’s most committed spokesmen for the essential role of culture in society. Now that the superstar cellist is nearing 60, he might be excused for wanting to step back a bit and pass the heavy lifting along to others. But no: With energies unabated, Ma remains on a constant quest to, as he puts it, “better interpret the world,” through performances and creative collaborations with like-minded friends, colleagues and arts and educational institutions — partnerships that leap across national boundaries. If that sounds high-falutin’, the music that Ma and his Silk Roaders put out there can be anything but. Whether it’s via the piercing wails of Cristina Pato on the gaita (Iberian bagpipe) or a Near Eastern hoedown involving Kojiro Umezaki’s spectacular shakuhachi (Japanese wooden flute) playing, their concerts of cross-cultural exchange often resemble global block parties more than concerts, packed with the exhilaration of discovery. In a recent phone interview, Ma took time out from a Silk Road rehearsal with the New York Philharmonic to explain how he’s managed to keep things fresh and new over the life of his ensemble. Finding common ground through the sharing of music always has been paramount with the ensemble, but Ma said the many close working friendships he and his colleagues have developed over the years has added a crucial dimension to Silk Road. The ensemble now has musicians from more than 20 countries, with a stable of regulars at its core. “The biggest takeaway is that we all feel more human, as a member of the planet, knowing people from different worlds who may be our neighbors or who may live far away,” the cellist said. “The feedback we get from different audiences around the world has made all of us think more deeply about what we do. By opening wider, we’ve been able to go deeper. Bottom line: Whether Ma is playing with Silk Road, performing at the White House or treating passersby to some impromptu Bach at the entrance to Chicago’s Millennium Park train station, his mission to promote better understanding across the global village will go on, he said.